Elizabeth I was Queen of England and Ireland from 17 November 1558 until her death on 24 March 1603. Sometimes called The Virgin Queen, Gloriana or Good Queen Bess, Elizabeth was the last of the five monarchs of the House of Tudor. Others from the same set (4), each with male portrait, revs. Armorial shields (2), Tudor rose and coronet; further counters (2), cross / rose and shield / rose. Very fine and unique group. A most unusual group or part set. Provenance: The Christopher Foley, F. Collection Of Early English Medals. 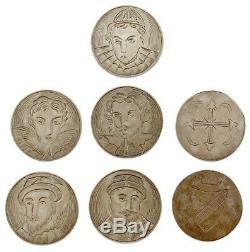 The item "Queen Elizabeth I, 6 engraved silver counters FREEPOST" is in sale since Monday, February 11, 2019. 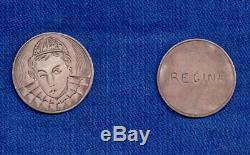 This item is in the category "Coins\Historical Medals/Medallions\European". The seller is "fem-art" and is located in Ferndown. This item can be shipped worldwide.